The Tsurumi line's main line (JR East) from Ohgimachi to Tsurumi, for the class 103 train. The line is electrified and passes through mainly industrial areas. Many nice objects both trackside and in the line's surroundings! There are some missing object files in the download from the creator's website. Also, the installers do not place files in the right place. On this website, you can download archives with all necessary files, see below. Map of JR Central's lines in the Tokyo are (Acrobat document) where the Tsurumi line is found at the bottom of the map marked with yellow color. The main line goes from Ogimachi via Anzen to Tsurumi. Object files to place in the OpenBVE directory LegacyContent\Railway\Object (Ohkawa branch line included). 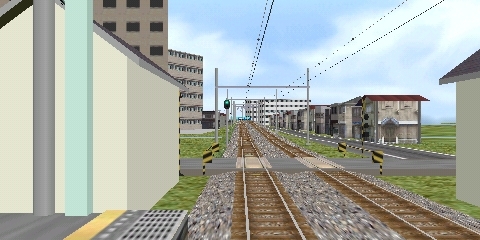 Route files to place in the OpenBVE directory LegacyContent\Railway\Route (Ohkawa branch line included). Sound files to place in the OpenBVE directory LegacyContent\Railway\Sound .